When my second child became “of age” he was in public school for kindergarten. So he received a certain amount of foundational reading training there, though I’m not sure exactly to what extent. The next year for first grade we brought him back home and the process of reading and tears that I was all too familiar with started again. So I stopped teaching him to read. That was two years ago now. Today he is eight years old and I just watched him start a new game of Zelda and read ever-lovin’ page of the thing. (And those of you that are familiar with Zelda know just how much reading that involves. And probably above his “grade level.”) Despite the fact that it’s been years since he had a reading lesson and (gasp) he’s not been made to read books since then, he has still managed to become quite the proficient reader. I also currently have a six year old. He has been the first of the bunch not to be burdened with unnecessary reading pressure. He’s not interested in reading very much, but he’s quite good at recognizing simple words. And we’re leaving it at that for now. This kid, my four year old – is fascinated with reading. And writing. And spelling. There isn’t a day that goes by that I’m not asked to spell something for him to write somewhere, or type into his game, or read from a newspaper, or magazine, or road sign . . . Mom, what does l-a-d-d-e-r spell? Mom, how do you spell “cow”? Mom, did you know there’s more than one way to spell “right”? While I cook he schools me on all the different “oom” words you can make if you change the first letter. Boom. Room. Zoom . . .
And then the other day, he finally did it. He picked up a book (albeit a board book), sat down of his own accord and sailed through three pages of it by himself. Granted, he’s into really fine literature right now like “Go, Dog, Go” and “The Hat Book,” but still. But it’s not so hands-off an approach that we simple toss them into the water to see if they’ll sink or swim. One of the reasons my four year old is excelling at reading is because I’m there to answer his questions and flesh out his phonic ponderings. Also, he’s the youngest of four. He hangs out with a 12 year old, an 8 year old, and a 6 year old all day. He learns so much from them. If my kids were in a traditional school setting my older three would be out of the house all day and the four year old wouldn’t have the benefit of their constant company. But the main reason, the driving reason behind his reading, is a combination of his own interest, talent, and passion for the subject. 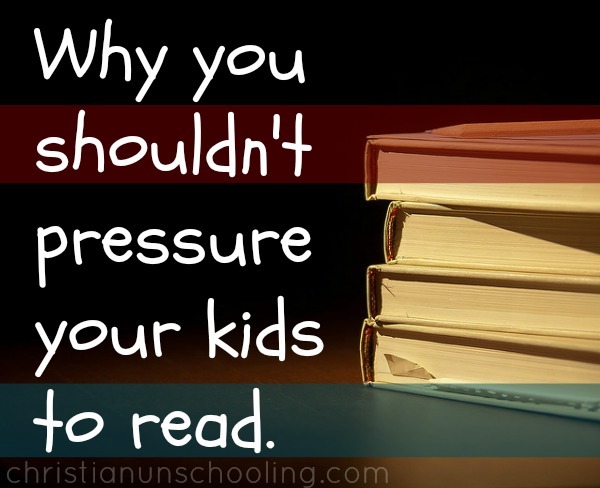 So, now that I have four kids who have reached the magic “reading age” I feel like I’ve earned the right to say: Do not pressure your 5 year old to read. It is wholly unnecessary. The answer is: you don’t. Not if they’re not interested or ready to. So back off. And pay very close attention to how they’re absorbing “reading readiness” from places other than books. If reading books was the measure of success I could easily say “I backed off of my son for two years, he’s eight now and he still doesn’t read books!” It’s true. He doesn’t. But he does read. And that’s what matters.